The BBC has recently started broadcasting a new history series, called The Inca: Masters of the Clouds, presented by archaeologist and British Museum curator Jago Cooper. I enjoyed Jago’s previous series, Lost Kingdoms of South America and Lost Kingdoms of Central America, which looked at lesser-known cultures in one-hour episodes, so I was excited by the arrival of more great TV from him. And that excitement was well deserved, because the first episode was fascinating. The thing that stuck out for me from the first episode was the bowl terraces. 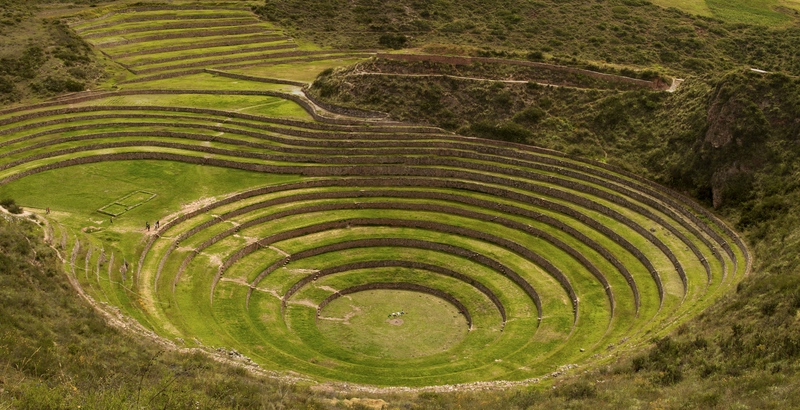 The Incas used circular terraces at this site at Moray, Peru, to create massive bowls of agricultural land with their own microclimates. The thick stone retaining walls absorbed warmth from the sun and radiated it back out at night, preventing the ground from freezing. The terraces were constructed with loose stones at the bottom for good drainage and fertile topsoil on top. And the overall structure, shaped like a bowl, reflected warmth down to the bottom so that while (during Jago’s visit) it was 16°C at the top, it was 23°C at the bottom – meaning that different levels could be used for different crops according to what kind of climate each crop preferred. It’s masterful manipulation of the land. The terraces at Moray, Peru. Picture source: McKay Savage. It made me think more about how we humans use the land to our own advantage. These days there’s a push to preserve the natural order of things for the sake of biodiversity and stable ecosystems, in order to protect the environment and prevent climatic changes which will have a net negative impact in the long run. But past cultures didn’t have much of an idea of how their manipulation of the land could impact the global or even local environment. A lot of cultures, particularly in areas with geography that makes agriculture difficult, used terracing to make the most of available land. Chinese rice terracing is one well-known example. Where land has been arid, people used irrigation, with massive irrigation ditches from hundreds or even thousands of years ago still visible in landscapes today in regions all over the world. All of this is to create food security. If the same land can produce more crops, and higher quality crops, it can support more people and those people can be healthier, with a surplus created to help those people weather the bad times, the droughts and famines. So how can I apply this to my stories? Food security, and manipulation of the landscape to increase food production, isn’t really something I’ve considered when worldbuilding. I’ve thought about national boundaries and religions and militaries. I’ve thought about the spread of the neolithic revolution, and of the progression technological ages – the bronze age, the iron age – from where they first developed outwards. I’ve thought about magic, and social structures and forms of government. This inspiration from the Inca civilisation has been a spur to think more about how the cultures in which I set my stories produce food and ensure that short-term climate change isn’t going to leave them starving. Do they have numerous massive storage barns, like the Incas, to supply their need in times of shortage? How do they make sure that their food production can support an urban population of craftspeople, traders and administrators in addition to the farmers? How do they change the land to increase production – and what impacts do these changes have, on the people working the land, on society overall, and on the local climate? These are the questions I’ll be thinking about as I continue to develop a particular world I’ve been working on. And as The Incas: Masters of the Clouds series continues, I’ll be looking out for more lessons to learn. If anyone has any good book recommendations, I’m very open to adding them to my A Year for More Reading challenge!